The 7th Annual Interfaith Climate Conference promises to be timely, motivating, and practical as it focuses on the theme of Cooler Together: Shared Visions for Action. The United Methodist Church of Davis will host this year’s dynamic gathering from 1-4 p.m. on Saturday, March 16. Doors open at 12:30 p.m. to allow participants to talk with six local groups that offer solutions to the climate crisis. All are welcome. The impacts of climate change – floods, drought, wildfires – increasingly fill the media. It can be very difficult to discern how to meet the resulting challenges. At this climate conference, the keynote speakers will each focus on specific ways individuals and communities can take meaningful action. The first speaker, Reverend Sharon Delgado is a longtime peace and climate activist. As a professional speaker she leads seminars and workshops on climate change, economic and environmental justice, and peace-making, always pointing in the direction of hope and action. The second speaker, Michael McCormick, will reflect on his experience tracking community sustainability action plans in California. He will discuss California community success stories and explore how both individual decisions and community choices together can produce significant carbon reductions. Register Now! Rev. Sharon Delgado is a climate and economic and environmental justice activist who continues to hope. The first speaker, Reverend Sharon Delgado wrote, “Climate change is an unintended consequence of a global system that produces vast wealth and leaves poverty, inequity, conflict, and environmental devastation in its wake. A warming climate will impact all ministries of faith communities and outreach efforts of secular organizations, especially among those who are most vulnerable.” (Quote from Love in a Time of Climate Change.) Her presentation will approach the climate crisis from a faith perspective, address demands for climate justice and system change, call on participants to both nurture creation and work to establish justice, and explore how individuals and faith communities can respond. Sharon Delgado – an ordained United Methodist minister – is a speaker, author, and founder of Earth Justice Ministries. She has been advocating for peace, justice, and the environment for over thirty-five years. 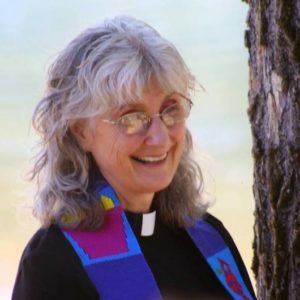 She speaks before spiritual communities and secular audiences on issues related to peacemaking, climate change, social and environmental justice, and alternatives to corporate-dominated globalization. She has published many articles on these themes. She hopes and works for the transformation of culture, government, and global institutions, and calls on people of faith and conscience to join the broad-based struggle for a peaceful, just, and ecological-regenerative world. 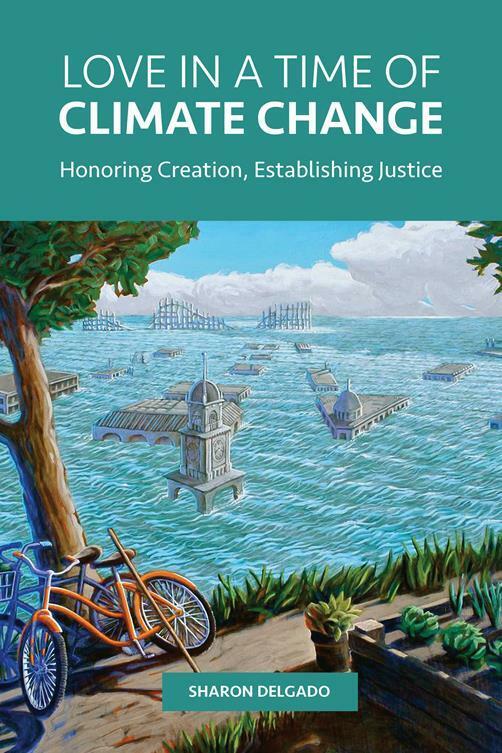 Reverend Delgado’s presentation will be based on her most recent book, Love in a Time of Climate Change: Honoring Creation and Establishing Justice (Fortress Press, 2017). Copies will be available for sale. Fortress will release an updated Second Edition of her previous book, Shaking the Gates of Hell: Faith-Led Resistance to Corporate Globalization, in 2019. Read book reviews and endorsements and find her thoughtful blog at www.sharondelgado.org Register Now! McCormick will explore choices for sustainability. The second speaker, Michael McCormick, AICP, is the Division President of Strategic Advisory Services (SAS) for Harris & Associates. For over 40 years, Harris & Associates has helped to improve communities and create better places to live through smart, safe, more sustainable planning, design and construction solutions. The SAS division does industry-leading work in environmental planning and compliance, municipal and special-district finance, one-water solutions, and applied technology. Michael was brought on in early 2019 to support the ongoing expansion of these services while also building new abilities for Harris in planning, climate- change mitigation and adaptation, and management consulting. He is a member of the Harris Executive Leadership Team, where he spearheads corporate sustainability initiatives and helps guide company-wide vision and strategy. 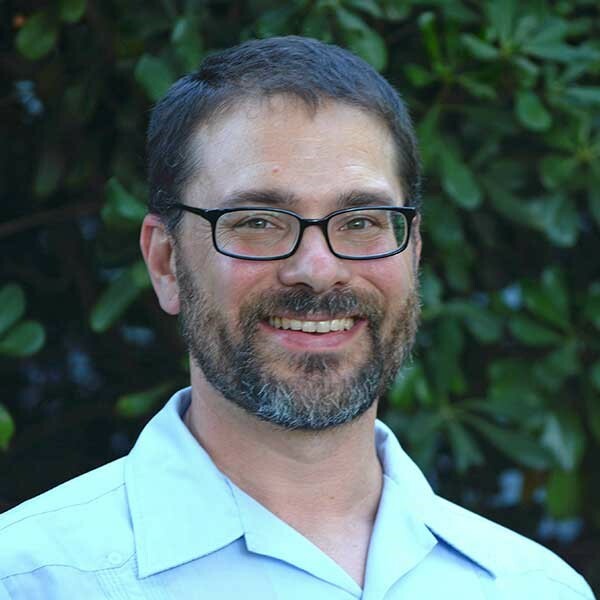 Michael came to Harris from the California Governor’s Office of Planning and Research (OPR) where he was the Senior Planning Advisor from 2011-2018, the principal staff focused on local government land use and climate-change efforts. While serving in this role, he completed an intergovernmental detail at the White House Council on Environmental Quality as Deputy Associate Director of Resilience, and as a Policy Advisor to the Assistant Secretary for Conservation and Management at NOAA. Prior these efforts Michael worked with local governments and special districts across the state as a consultant and local government planner. He wrote the first CEQA-compliant climate action plan in California in 2009 and has authored dozens of climate action plans and greenhouse gas inventories. Michael led the work at the State to standardize local climate action planning in California and has supported global climate initiatives under Governor Brown and at the White House Council on Environmental Quality. He lives in Yolo County with his wife, daughter, mother-in-law, exchange student, and various animals and helps support local work on climate change as the Board President of Cool Davis and as a member of the technical advisory council for the Sacramento Mayor’s Commission on Climate Change. You will find him most weekends in his backyard with a set of pruners in his hands shaping fruit trees and snacking on garden vegetables. Michael is a fellow of the American Leadership Forum, active in local non-profit and professional organizations, and is a member of the American Institute of Certified Planners. Michael is originally from Florida and has his Master’s in Urban Planning from Florida State University. Michael McCormick first learned about the City of Davis greenbelts, bike paths, and energy codes as an example of best practices as part of graduate school in urban planning in Florida. 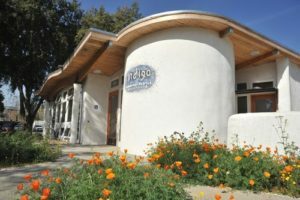 He believes Cool Davis is opening the next chapter of innovation to achieve the City of Davis’ carbon neutrality goal. As an active transportation enthusiast and new Davis resident, he is proud to be part of this community, including the history and the future that Davis is helping to create. He believes personal commitment is the starting point for slowing climate change. 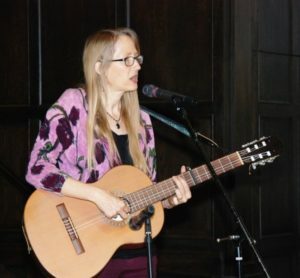 Laura Sandage – Between the two keynote speakers, local singer, songwriter, and community songleader Laura Sandage will lead participants in the song she wrote for the Interfaith Alliance for Climate Justice: We are One with the Earth. Panel Discussion with Audience Q & A – After the refreshment break, conference attendees are invited to submit questions to a panel including the two keynote speakers and two additional community members: Dr. Dan Smith, pastor at Lutheran Church of the Incarnation, who wrote his dissertation, “Toward a Lutheran Theology of Nature: An Ecological Ethics of the Cross,” as an expression of his commitment that addressing climate change is a matter of faith, and Dr. Carl Linvill, a former utility commissioner, who is currently a Principal with the Regulatory Assistance Project (www.raponline.org) and a congregant at Lutheran Church of the Incarnation. Dan and Carl will engage the panelists in a discussion connecting faith to community collaboration and will invite attendees to participate in the dialogue. Lightning Talks: Resources in our Community – Six local community voices will speak very briefly about solutions they offer to local residents. These same folks will be at their tables in the social hall at 12:30-1:00 p.m., during the refreshment break, and briefly after the conference ends. Register Now! 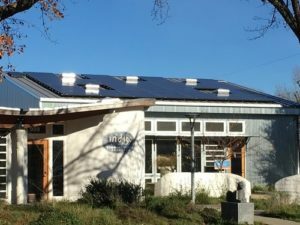 Cool Davis – an active network of residents, community organizations, businesses and community institutions committed to implementing the City of Davis’s Climate Action and Adaptation Plan. Their mission is to inspire our community to reduce greenhouse gas emissions, adapt to a changing climate, and improve the quality of life for all. They focus on ways to shift home energy efficiency, transportation choices, and consumption habits away from the use of fossil fuels. Stop by to find out what events are coming up or how you can volunteer. Don Saylor promotes the solar energy of Valley Clean Energy. Valley Clean Energy – VCE was formed by Davis, Woodland, and unincorporated Yolo County to be a not-for-profit electricity provider that delivers cost-competitive clean power, product choice, price stability, energy efficiency, and greenhouse gas emission reductions. VCE seeks to offer residents and businesses electricity service with more renewable content at competitive rates. VCE also seeks to increase the amount of local generation and low-carbon options; establish a local framework for developing local energy; and accumulate reserve funds for future projects. VCE looks forward to answering your questions at their table. Register Now! Members of DEVA are crazy about EV’s! Davis Electric Vehicle Association – DEVA advocates for electric vehicle adoption and supports the development of EV infrastructure regionally. DEVA is a special kind of car club made up of electric vehicle owners, prospective owners, and enthusiasts from the Davis and Sacramento area. 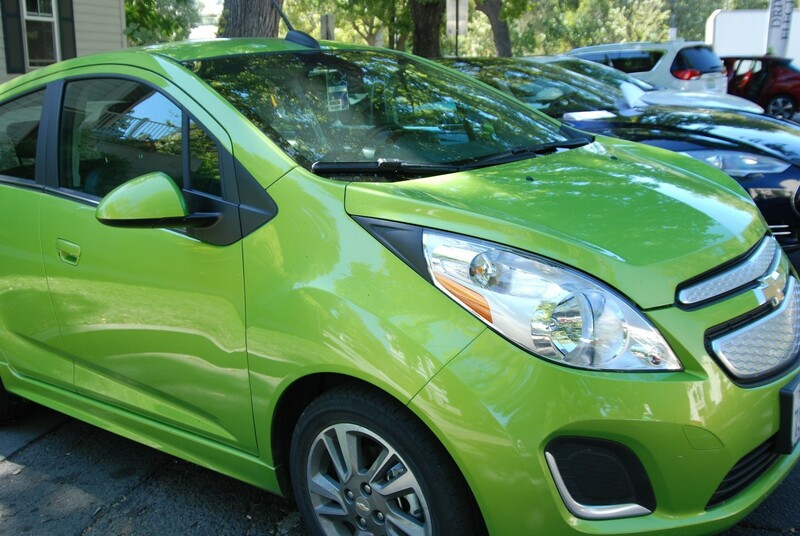 DEVA is a working group of Cool Davis and an affiliated sub-group of the Sacramento Electric Vehicle Association (SacEV), a chapter of the national non-profit Electric Auto Association. They meet on the second Wednesday of every other month from 6:00-7:30 p.m. at Repower Yolo. All are welcome. COOL Cuisine – COOL Cuisine is a coalition of organizations and individuals advocating for more plant-based dining options. Supporters eat this way for many individual reasons: to sustain the planet, to increase their physical health, and/or out of compassion for all living things. Since 2013 COOL Cuisine has held meet up events at restaurants to vote with their wallets. This support of local businesses helps the group advocate for improvements. In 2019 the group is focused on broader community engagement through encouraging plant-based options at public events, such as annual community festivals and fundraisers, local company catering and events, and DJUSD. This offers all diners the opportunity to eat a lower carbon meal more often. Together as a community we can work toward our climate action goals! A recent success was the Sunrise Rotary Oktoberfest, where for the first time Beyond Sausage was offered and chosen by 15% of the attendees! 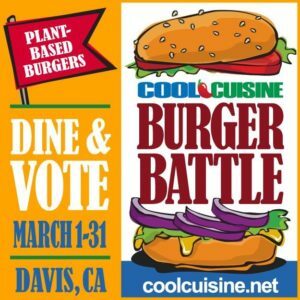 The Burger Battle is on all of March in 17 locations in Davis. Hungry? Try a veggie Burger and vote! 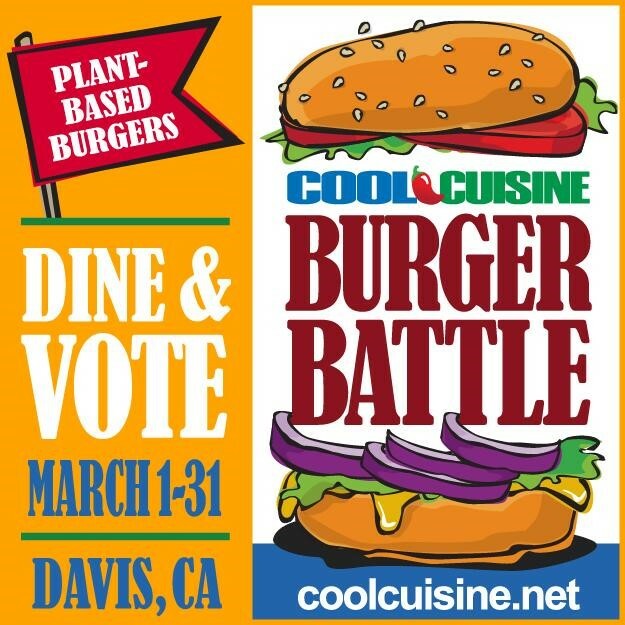 COOL Cuisine Burger Battle – Throughout March, COOL Cuisine presents 20 chefs/restaurants competing for your votes with 20 planet-friendly, plant-based, and mouth-watering burgers for you to sample! Take a friend or gather a group to visit competitors and buy and taste as many battling burgers as you can. Don’t forget to vote on each one you try! www.COOLcuisine.net posts participant locations/schedules, burger descriptions and ingredients, and the voting link. Try as many as you can! Support local businesses and treat yourself to yummy, healthy meals. Register Now! Indigo exemplifies the beauty and mystic of a ZNE building! Indigo –Harnessing the Beauty and Power of Nature for ZNE Today, buildings account for 40% of carbon emissions in the US. Zero-Net Energy (ZNE) buildings, on the other hand, passively draw energy from the environment and collect any extra energy they require from photovoltaics. Indigo’s mission is to express the beauty and power of nature through design. From this commitment flows their ability to design buildings that can passively extract energy from the environment – natural light and warmth from the sun; natural ventilation; cooling from shade, breezes and the energy absorbing qualities of water and mass. Such buildings are both adaptive to the realities of climate change and help mitigate it by using dramatically less energy, and sometimes even producing their own energy from clean, renewable sources. Indigo designed their office in Davis (an adaptive re-use of the old Dairy Queen building at 909 5th St. across the RR tracks from Hibberts Lumber) to be the first ZNE office building, certified by the International Living Future Institute, the 13th building in the world of any type to rise to this challenge. Solar panels add to the efficiency and comfort of most buildings as they do here at Repwer Yolo. Sharon’s book will be available for sale. Earth Justice Ministries – Sharon Delgado will sell her latest book: Love in a Time of Climate Change: Honoring Creation, Establishing Justice. She may have other materials as well, and it’s an opportunity to ask her questions and get a signed copy of her book. Register Now! Greenfaith – GreenFaith is an interfaith coalition for the environment that works with houses of worship, religious schools, and people of all faiths to help them become better environmental stewards. They believe in addressing environmental issues holistically, and are committed to being a one-stop shop for the resources and tools religious institutions need to engage environmental issues and become religious-environmental leaders. GreenFaith inspires, educates, organizes, and mobilizes people of diverse religious and spiritual backgrounds globally for environmental action. Their work is based on beliefs shared by the world’s religious and spiritual traditions. They believe that protecting the Earth is a sacred act, and that environmental stewardship is a moral responsibility. Yolo Interfaith Alliance for Climate Justice – The mission of the Yolo Interfaith Alliance for Climate Justice is to inspire our faith communities to work together to reduce our dependence on fossil fuels, educate ourselves on climate issues and speak out for climate justice. Clergy, leadership, and members of all faiths and interested others are welcome. Yolo Interfaith Alliance for Climate Justice is open to members of any faith group who wish to address climate justice and climate disruption issues on a variety of levels.